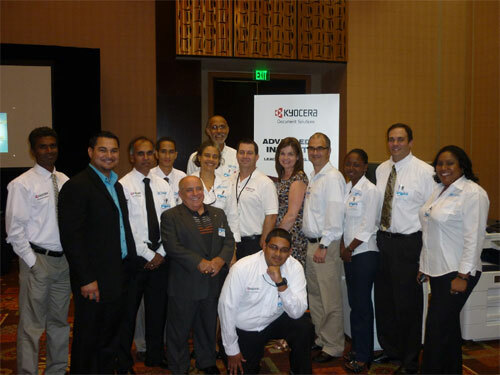 BEI hosted the first ever independent Kyocera Product and Technology Fair in Trinidad. The event took place on May 9 &10, 2012 of at the HYATT Regency Hotel and was well attended by many IT Personnel, Purchasing Officers, Software Consultants and Workflow Specialists. The fair showcased Kyocera’s Technology with a major focus on their Document Solutions product offerings. There were general and technical seminars conducted by fully trained representatives from Kyocera Document Solutions America Inc. Some of the main features of the event included demonstrations of “Free” Kyocera Document Management Software such as Hybrid Platform, Access Lock and Prescribe. Other Document Management Solutions included DMS Link specific to the Healthcare, Legal, Finance and Education Industry. Main attractions were Teaching Assistant for the Education Sector, Sharepoint Connector as well as Paper Cut Account Management solution. Customers and interested personnel who attended showed a keen interest in Kyocera’s Document Solutions Technology and were amazed at the software capabilities for such an affordable investment. The excitement created by the fair has indicated the desire to improve efficiency in organizations and BEI is prepared to support their customers in the Document Solutions arena.